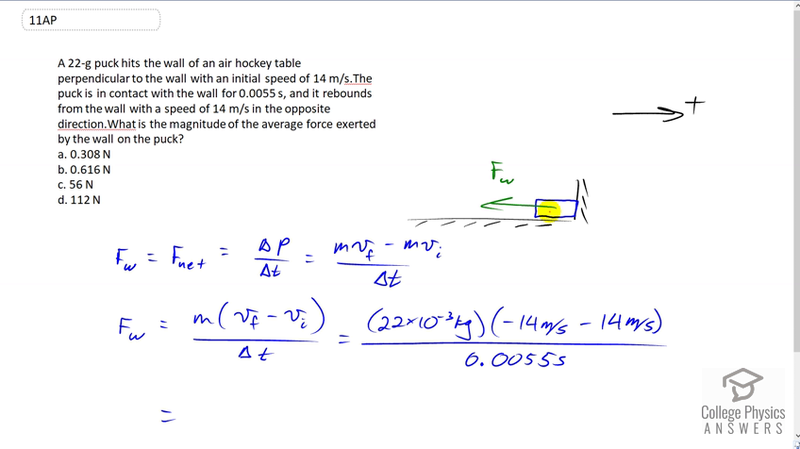 A 22-g puck hits the wall of an air hockey table perpendicular to the wall with an initial speed of 14 m/s.The puck is in contact with the wall for 0.0055 s, and it rebounds from the wall with a speed of 14 m/s in the opposite direction.What is the magnitude of the average force exerted by the wall on the puck? ed1ch08ap11 This is College Physics Answers with Shaun Dychko. This 22 gram puck hits the wall of an air hockey table and while it's in contact with the wall there is only one horizontal force exerted on it which will be the force due to the wall which makes it the net force. That makes it the change in the momentum over change in time and we can expand change in momentum as mass times final velocity minus mass times initial velocity. Then we can factor out the common factor m, say it's m times vF minus vi over i>delta t. So the force due to the wall is going to be 22 times ten to the minus three kilograms, times the final velocity which will be negative 14 meters per second because that'll be the to the left after it bounces off the wall --we're taking to the right to be positive -- minus the initially positive 14 meters per second velocity before it hits the wall and we divide that by 0.0055 seconds of contact time with the wall. This makes 112 Newtons so the answer is D.